Can’t beat a bit of home grown! Last weekend I visited my cousin Jane and her husband Andy at their lovely home in South Devon. It’s a fantastic house, but it’s the garden that I envied the most! Almost an acre of land allows them to produce all kinds of fruit and vegetables, whilst a small orchard to the rear of the garden promises to tend to all their cider needs in the future! Sadly my own garden is far less substantial and shared with about 15 other properties so my vegetable patch will have to wait. I have, however, arrived home with a chilli pepper plant. My husband LOVES chillies and spicy food; he adds chillies to his pizzas and hot sauce to scrambled eggs, and well, anything actually. So I’m planning on having a sustainable chilli source! I presume it may take a year or so before the crop will exceed a small jar of chillies, but I’m starting small. 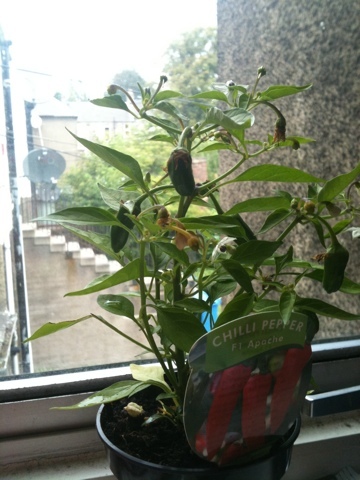 This plant only cost me £1.75 at the Eden Project in Cornwall so if it gives me ANY chillies, I’ll be happy. Also, if you’ve visited my blog today, a very big HELLO to you! This is my first post, hope it’s been of interest. Visit again soon!